Though it's brewery is only 80 minutes away from the house of beer (blog), Southern Tier has not become one of our top breweries to try. Unearthy was delicious but the oaked aged version tasted like a tree with hops somewhere in the middle. Since it is now October, we have decided to get more festive than a Governor Mark Sanford hiking trip. We are infected with the fall spirit like it were crabs. It may itch a little but we decided to give Southern Tier Pumking a try. With a basic amber color, it is Pumpking's smell that foreshadows what lies ahead. 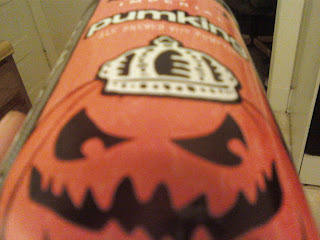 If you ever wondered what beer pumpkin pie would taste like, this would answer it. The essence of this brew is far more present than other, watered down versions of this style. It has more body than Jessy Ventura. The 9% ABV is not completely hidden but balanced as part of this complete breakfast. This brew is great for what it is, a spiced fall seasonal. It conveniently comes in a 22 oz bomber, as a six pack would be too much of it. At the end of the glass, it became a little too sweet for our liking. This being said, two bombers a year (and possibly one to cellar for nostalgia) would be sufficient for our needs. It holds its place as one of the best pumpkin beers we have tried, but still less superior to Dogfish Head and Weyerbacher's versions. It may have been the first sip, but we we got punk'ed.